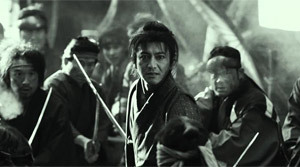 Story: Manji (Takuya Kimura) kills his superior and the man's subordinates. One of them turns out to be his sister's husband, though. She goes mad and Manji travels the country along with her until eventually a bunch of bounty hunters catches up with him who would get a fair bit of money for him. They kill his sister in front of his very eyes and Manji starts a killing spree at which end he is fatally wounded himself. However, a mysterious old lady appears and plants a few bloodworms inside him. They heal him and are the reason why he is henceforth immortal. Fifty years later the dojos of the country are defeated one after the other by a group of the name "Itto Ryu", led by exceptional swordmaster Anotsu (Sota Fukushi). Anotsu wants to integrate all of the country's schools into his own. One of the teachers he kills is the father of the girl Rin Asano (Hana Sugisaki). She vows revenge and runs into a mysterious, old lady. She tells him of an immortal swordmaster by the name Manji. When Rin eventually meets Manji he isn't interested in helping her. But he changes his mind since the girl looks like his sister. Soon, he has to realize that the "Itto Ryu" members also have quite a few exceptional powers. Now you may say that you don't necessarily have to beat the aforementioned movies in terms of quality to deliver a good movie. Yet, the fights turn out to be a bit monotonous for my taste. As someone who appreciates sophisticated choreography the countless fights in which Manji battled his way through hordes of enemies seemed rather uninspired most of the time. Granted, it may be a bit difficult here to grab the viewer's attention since one sword strike equals another dead guy, but even in the one-on-one skirmishes against the many right hand men of the villain that certain something is amiss. This particularly becomes obvious retrospectively when we get to see a pretty nicely choreographed fight during the showdown after all. Sadly, I'm not familiar with Hiroaki Samura's manga, but I can tell you that the numerous exotic weapons play a major part in it. You can also tell this when watching the movie adaption and they surely stand as a little highlight. But then again it's somewhat disappointing that most of the weapons are introduced only a little and don't get the attention within the fights they would have deserved. Here, a little bit more elaborateness concerning the choreography would have been desirable. Next to that there are countless colorful characters, who all are clearly the product of a manga, which can't just be pinpointed on the spiky haircuts, but also the customes and personalities. Latter ones seem to be interesting since every henchman has his own tragic backstory to share, but the movie doesn't do much with them either. 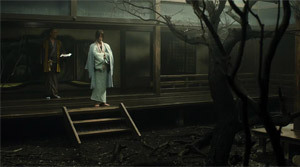 Instead, the film tries to squeeze as many characters into the story as possible. This approach makes the movie seem episode-like and the face-offs between the hero and the several henchmen just become tiring at some point. The big bloodshed showcased during the finale clearly proves that Takashi Miike didn't do himself a favor leaving the movie at a running time of 140 minutes. There may be entertaining scenes every now and then and some good ideas, but it is on the verge of getting lost in a sea of repitition. 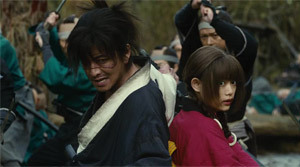 Maybe because of this it isn't astounding that "Blade of the Immortal" has its best moments when there is critical reflection about who is killing why and for whom. Accordingly, the dialogue isn't bad and the political subplot isn't poor either. The movie should have worked with those pieces or with the individuals more for us to be moved by their fate. Unfortutely, the characters remain quite dreary. 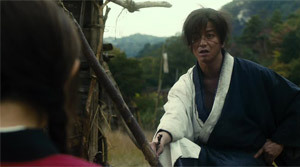 Takuya Kimura ("Love and Honor") puts great effort into pulling off a multi-layered individual, but as we don't see any new facets in Manji with time, boredom starts to creep in. 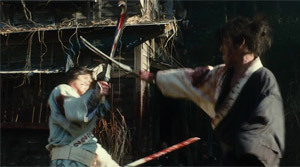 At least, Takuya Kimura manages to completely satisfy in the fight scenes. 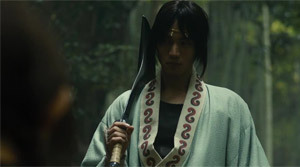 Apart from that there is maybe Sota Fukushi ("My Tomorrow, Your Yesterday") as the villain who deserves to be mentioned on a positive side note. He has something mysterious about him which once more makes the line between good and evil become blurry. One strength of the picture is thus that there is constant questioning of whether we can really speak of good and evil when it comes to the actions we see. And despite all criticism the great amounts of blood spilled and countless chopped off body parts - yet, Miike even holds back, it seems - make for an entertaining samurai flick. There just would have been so much more the movie could have been, had Miike sticked to a red thread running through the story, removed the episode-like flair, trimmed down the film in general and would have directed his attention on the interesting storytechnical aspects.